Primo | Symo 3-Phase | Smart Meter | Solar Web | Smart Phone App. 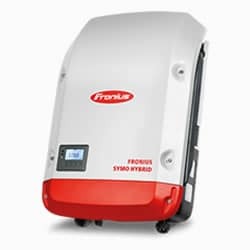 Fronius has been in business since 1945 and is now a big name in solar PV. They lead the world in PV solar inverters. They make some of the best PV products for the home and business. Of course they are now a main player in this country as well. There are two ranges we stock, the single phase Primo and the three phase Symo. The Primo ranges from 3kW up to 8.2kW whereas the Symo runs from 3kW up to 20kW. Both have free Wi Fi so you can see what your PV is doing on Solar Web. That's a free app you get when you log in on line. And in fact both of them can link up with the Fronius Smart Meter too. Right now they give a ten year warranty as well, but that might not last. The Symo and Primo both came onto the market here in 2015, and since then have been a sales hit. The models in both ranges work well and have a great out put level of 97.8%. So add this to smart MPPT software taken from years of testing in the field. And what you have then is an inverter that gives you more. It looks like quality and it is. They have "DPM" and that allows more out put where there is shade. "DPM" is short for a long fancy term that we don’t use here, but it means its good. It's now 2019 and so by now, we know that these units live up to the hype. They work without fuss so you can rely on them. And in places where the Grid is not as stable too. That's a fact. But they have great service as well. So that will keep you making lots of watts in years to come. So, what's it like to put one of these things in? How hard is it? In short, the Snap IN verter is a gift to put in, it's so easy. In fact of the things that the Symo and the Primo share, this is one of the best. The brains at Fronius have worked hard on this thing, and you can tell. They have built a product that goes together well. Also, its great too for the people who buy them as well. So you want to know what your system has been doing? Too easy. It's a piece of cake to hook up by Wi Fi or the LAN port to a home network. That lets you find out what your PV kit is doing at any time of the day, any place. All you have to do is log on to the free web site, Solar Web. Then you can see what's been happening. You can in fact log in on your Android or iPhone too. It doesn't get any easier than this. Before you read more, this is a great unit but only if you have three phase. So it’s sad to have to tell you that there is no single phase unit just yet. But by the time you get to read this, let’s hope that might have changed? So we know well by now, that the hybrid PV solar inverter is all the rage. Yes, in fact there are a quite a few on the market, that's for sure. But of all of them out there, the Symo Hybrid is the only one for us. In fact, it is one of the first on the market that can handle high voltage. So what does "Hybrid" mean? In essence it’s a thing that’s a bit of two things. Yes it’s an inverter, but it is one that can take a battery with it as well. After you read that you might think, well that's great let’s go and get one then. Not so fast. These are without doubt the best of their kind. But it’s not good to get one if you don’t put a battery on it right away. That's our take on things, and there's a few that don’t agree with that of course. The reason we say that, is because tech moves so fast. That by the time you hook up your battery there will be new models you can get. It may end up then to be a big waste of money. So you have to watch what you are doing. In other words, do the sums to be 100% sure that it is wise to invest. Also to note, that its one of the only inverters that can hook up to a Tesla. In fact the Symo PV Hybrid has the same features as the other two models in the range. So if you want to go into detail, just down load the data sheet, it’s all there. Well, what on earth is a Smart Meter so you say? We try to keep things simple here, so I won't hit you with a long description. But it's a device that tells you how much power goes through your home. It will work out what is the best way of using the power from your PV. So that might be to use it in your home or send it off to the Grid. Of course when it does that, you get some money for it. And while it's doing all that, it takes note of things. In fact you can keep tabs on what is going on and at what time of day. But it will help you work out what the power load is in your home too. This will be good to tell you what size battery to get. If you then decide to get one, one day. The Smart Meter can switch PV power for hot water and pool pumps. It only turns them on when your PV puts out enough power. So when all's said and done, it's a pretty smart thing. 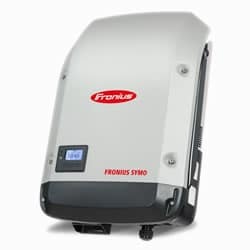 If you own a Fronius Symo or Primo inverter, you can use the Fronius Solar Web too. This lets you see in fact, what is going on with your solar PV. Once you have this set up it will be easy to keep an eye on your solar. And you can do this while you are at any place in the world, and on your phone or PC. Many firms have web sites the same, so where you log in and check what your PV has been doing. Once you work past the page where you register, it's a smooth ride. In fact, we like this one much better than most others. Keep it simple or go for a "Smart Meter". Solar Web is good but it will not show you what each appliance is up to. For more, you will need a "Smart Meter", but even this will not give you much more. So the "Smart Meter" gives data on what your PV has made, and where the power has gone. But it only shows export to the Grid and how much used in the home. Some programs let you to check on each panel, but they don’t always work like they should. In fact you can get false alarms with them that can be a pest. That is why we don’t like them that much. But in time, that will change too and things will get better. So "keep it simple" and stick with the basics but get a "Smart Meter" if you must. The basic kit will let you to keep an eye on things, but without extra cost. Many solar owners are keen when a PV kit is new, but this goes after a few weeks. But most just take a look now and then, and forget about it. Learning how it all works can also show up a few bugs - just be patient with it. So, if you want to know more, go to the Fronius web site. This is a free app that you can get on Android or iPhone. Use this on your smart phone so you can get on to Fronius Solar Web. It gives you basic data for your Solar PV so you know what is going on. If you have any other things such as pool pumps, they can be turned on or off too. But these must be already on a Smart Meter as part of your PV set up.